When I moved to Northwest Florida, I formed a production services association to network with fellow production people. One of the first people I befriended was Denise Daughtry, who was the Pensacola film commissioner. When I was pregnant with Jack, she invited Dave Dorman and me over for lunch one day. As we sat in her fabulous kitchen, adorned with gorgeous antiques–my favorite thing–in walked her tall, gorgeous husband, bigger than life. He had this enormous stage presence, and reminded me a lot of western star Clu Gulager, but better looking. Dave Daughtry, my friend, mentor, and someone who was just as beautiful on the inside as he was on the outside. It was then that I witnessed my Dave–who has met everyone from George Lucas to Guillermo del Toro–become starstruck. I’d never seen this before! Since I was new to the area, I didn’t realize Denise’s husband Dave Daughtry had been the nightly newscaster on the Pensacola TV station. But my Dave, who had lived there for 25 years, adored and admired him from afar. And now he was getting to know Dave Daughtry up close and personal. For the remainder of the time I lived in Florida, they were an integral part of our social circle. They were with me at 5 p.m. on November 2nd when my first labor pains kicked in, and they were the first to meet newborn Jack in person, after Dave and my parents. James Bond had nothing on Dave Daughtry. Last year I got to spend more time with the Daughtrys than usual. They hosted me in their lovely, historic home on many occasions as I traveled to the area on business. Dave would drive me to the airport with his two beloved standard poodles, Peachy and Pal, in his Jeep. We had great conversations and plenty of laughs. To say I will miss him is an understatement. Funeral services will be held Saturday for Dave Daughtry, a popular figure in local radio and television for more than 30 years. Mr. Daughtry died Tuesday at a Pensacola hospital. The native of Macon County, Ala. was 76. Services will be held at 11 a.m. Saturday at First Baptist Church in Pensacola. Visitation will begin at 10 a.m.
Mr. Daughtry, who got his start in broadcasting at a small radio station in Andalusia, Ala., had hosted the morning show on WEBY-AM in Milton for the past 14 years. In addition, he moderated a Sunday night BLAB-TV show, “Justice for All,” featuring attorneys Barry Beroset and Tommy Ratchford. 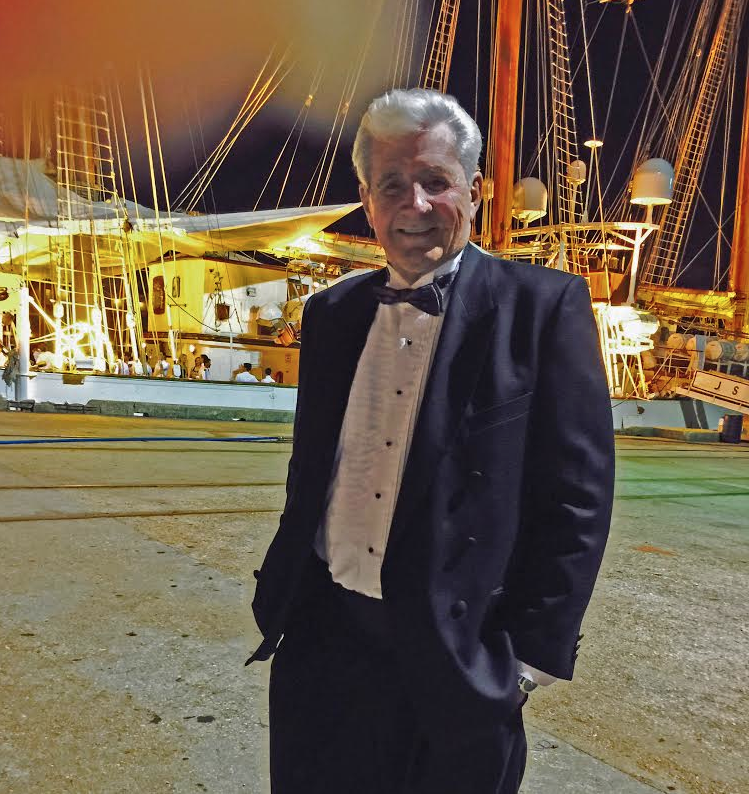 Although he also had been an anchor on WEAR-TV in Pensacola and a reporter-anchor on WALA-TV in Mobile, “radio was what he loved most,” said Denise Chenel Daughtry, his wife of 26 years. His love meant long and early hours. He started preparing for his two-hour show at 2:30 a.m. and arrived at the Milton station at5 a.m. in order to go on the air at 6 a.m. In addition to delivering news, weather and sports, Mr. Daughtry created a whimsical character, “Farmer Dave,” who dispensed folksy bits of philosophy. The “Farmer Dave” title was tongue-in-cheek, his wife said, because he knew a lot about gardening but little about farming. However, he knew a lot about broadcasting in a career that covered several states and innumerable assignments. From that first job in Andalusia Mr. Daughtry went to Huntsville and worked his way up at other stations before moving to Nashville, Tenn. and switching to television. He was news director and anchor for WSM television and dominated the ratings there for several years. He was press secretary for the City of Knoxville and also worked at television stations in Memphis, Tenn. and Washington, D.C.
Mr. Daughtry came to Pensacola more than 30 years ago to anchor the news at WEAR-TV and then spent several years with WALA-TV. 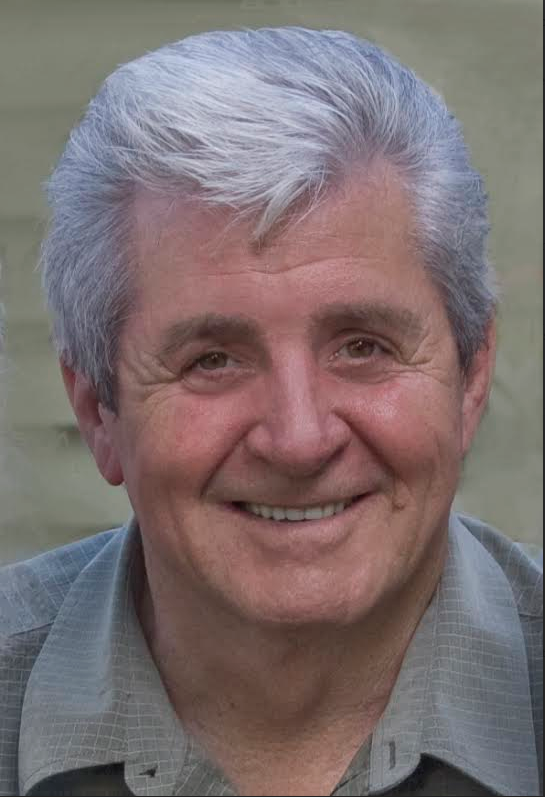 Along with his love for newsgathering and writing, he had a strong voice and loved to belt out songs. His beloved dogs Peaches and Pal often accompanied him on trips from his home in the Historic Seville District in Pensacola. In addition to his wife, he is survived by three children: Bonnie Daughtry Barazza (Mike), Michael Daughtry (Sheila) and Patrick Daughtry (Lynn), all of the Auburn, Ala. area. He also leaves behind seven grandchildren: Lindsey Seal, Shannon Barazza Hlcome, Evan Barazza, Patrick Houston Daughtry Jr., Amanda Daughtry Van Ausdal, Shelby Prestridge and Benjamin Daughtry. Mr. Daughtry also was eagerly awaiting the birth of his first great-grandchild by Amanda and Don Van Ausdal. Ten years ago today, 16 days past my due date, Master Jack arrived at Sacred Heart Hospital in Pensacola. Jack rather enjoyed his own personal swimming pool, and no amount of Pitocin was persuading him to leave it, so a c-section it was. He was born at 4:23 a.m., and he’s still an early morning person. Those were crazy times for us. Our home was half-destroyed in Hurricane Ivan on September 15th, so we were trying to rebuild our house with a shady contractor (who regaled me with his tales of prison life and the finer points of cooking crystal meth) while also working full time as two freelancers, and mentally preparing for life with a newborn. I’m glad it’s all in the rearview mirror, but I’m still awed by how this Decade of Jack-ness has whirled past me like the Tasmanian Devil on a tear. I can still remember how Dave was taken aback by Jack’s bad horseshoe arrangement of frizzy orange hair, which reminded Dave of his least-favorite relative. My friend Denise Daughtry was taken aback by Jack’s strong neck muscles–at 12 hours old, Jack lifted his head up off of my shoulder to watch Denise walk across my hospital room to greet him. His intense gaze never left her, and he held his head up insistently, minus any neck support from me, for several minutes. I had zero experience with newborns, so I had no context for how weird this was at the time. Jack’s light blue eyes couldn’t handle the fluorescent lights above his crib in my hospital room, so he grabbed his bassinet blanket and pulled it over his eyes with intention, creating a sleep mask. I knew he meant business, because I tried pulling it off of his face, fearing SIDS, and he just grabbed that blanket in his tiny fists and pulled it back over his eyes. It was our very first battle of the wills. He won. At age five, Jack sat down at my piano and began playing what sounded like New Age music. His music kept evolving with each passing day. I was brimming with ideas that Jack might have some innate musical talent, since Dave’s Russian grandmother was a professional violinist. I signed him up for piano lessons. In no time, those lessons erased any joy Jack ever felt for playing piano. Even now he refuses to play the improvisational music that was so effortless for him five years ago. I beat myself up over the fact that I’d ruined him for music, but then a glimmer of hope arose. 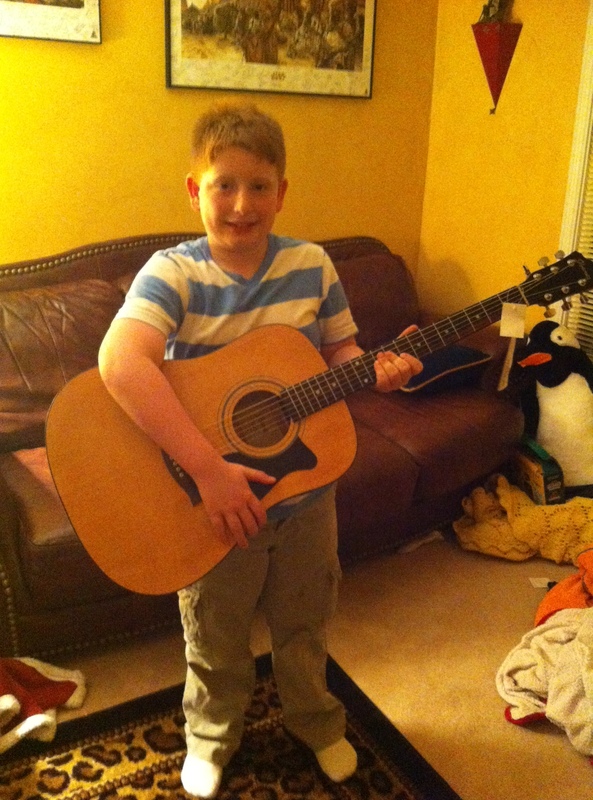 This past six months, Jack started asking for a guitar. I asked Jack his plan for learning guitar. “YouTube,” he replied. Tonight over birthday cupcakes, Jack divulged that he and his friend have already formed a band, Strings of Lightning, despite having almost zero musical prowess. I have a soft spot reserved for ambitious earthlings. We talked through his logo design–a zombie fist holding a guitar, as lightning strikes it, forming an “X” pattern. In my mind’s eye, the t-shirt design is already being worn by an amphitheater full of adoring fans holding lighters, beckoning an encore during Jack’s first world tour. (There’s a little Beverly Goldberg in the heart of every mom, isn’t there?) Of this I’m certain: This next Decade of Jack-ness will whirl past me lightning fast–like the Tasmanian Devil on yet another tear.